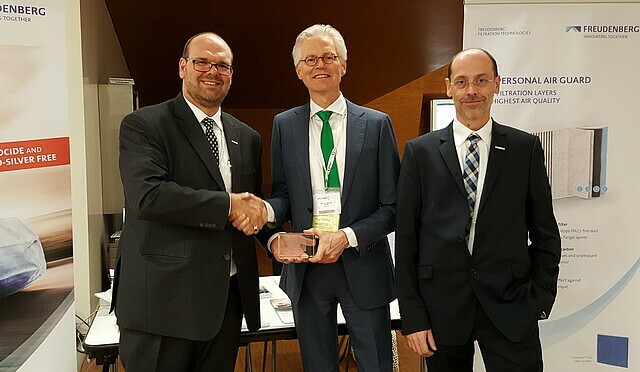 The FILTREX Innovation Award was presented for the first time by EDANA, the world’s leading association for nonwovens. During the FILTREX conference, the five nominated companies presented their innovations to industry experts and conference participants, who subsequently voted for what they regarded as the most innovative filter solution 2017. With Freudenberg’s micronAir blue, the inventor of automotive cabin air filters has set new standards in terms of health protection. “Whereas conventional automotive particle or combination filters only prevent the penetration of soot, dust and unpleasant odors through the ventilation system, the patented multilayer design of the micronAir blue premium filter reliably keeps out particulate matter, allergens and microspores from mold, long-term. This enables us to offer vehicle occupants the best possible protection for the upper and lower respiratory ways”, Oelsner explained. Thanks to its high separation performance, the cabin air filter prevents even the smallest pollutant particles from entering the vehicle interior. Particulate matter represents a significant risk to health, especially in densely populated regions. Worldwide, more than 3.3 million people die every year as a result of high levels of air pollution caused by particulate matter. This situation is what inspired Freudenberg to develop micronAir blue: a new high-performance particle filter for the independent automotive parts market. The new filter minimizes health risks for vehicle occupants and contributes to driving safety in road traffic. The micronAir blue filter is based on a novel material design that combines four filter layers to achieve the highest air quality in the vehicle interior. Different dimensions of synthetic fibers are used to retain coarse-grained to ultrafine fine dust particles, while the reliable adsorption of odors and gases is taken care of by an active carbon layer. The filter also features a biofunctional layer that highly efficiently and permanently neutralizes allergens. The layer uses biocide- and nanosilver-free additives with high long-term stability, which have been scientifically proven harmless to humans. The automotive cabin air filter thereby aims to meet the increased hygiene requirements of VDI 6032, which are aimed at protecting allergy sufferers and asthmatics as well as possible. To this end, Freudenberg conducted a thorough research project during the filter’s development phase, which also involved the independent Austrian research institute OFI, among others.